Washington Street in Hoboken, a picturesque main drag blocks from the Hudson River, is a restaurant and night-life destination for residents of this fast-growing city and beyond. It was named one of the nation's Top Ten Great Streets by a planning group last fall, and draws tourists by the busload, thanks in part to the popularity of the TLC reality show "Cake Boss," set at Carlo's City Hall Bake Shop at No. 95. 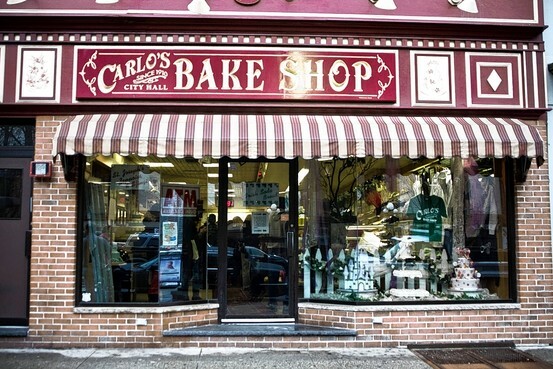 Washington Street is home to Carlo's Bake Shop. Yet the strip has also been dogged in recent years by vacancies and turnover. Two of its largest retail spaces now stand vacant: Blockbuster Video, at 412 Washington, closed earlier this month; and Barnes & Noble, which formerly occupied a 9,000-square-foot space at 59 Washington, shut its doors a year ago, Around a dozen storefronts on an eight-block stretch between Seventh Street and Observer Highway are currently closed. "I'd say the jury's still out," Michael Novak, president of the Hoboken Chamber of Commerce, says about the health of Washington Street. "For most of the larger retail spaces that were vacated or are being vacated, I don't see new tenants." After gaining fame as the birthplace of Frank Sinatra, Hoboken has seen steady gentrification over the years from its blue-collar roots. Its population grew almost 30% to 50,000 in the past decade, according to the 2010 Census, with residents drawn by the quick PATH or ferry ride away from Manhattan, tree-lined streets and relative affordability. The amenities of Washington Street have grown as well, and now include a mix of high-end supermarkets, boutiques, bars, restaurants and other services. But the economic downturn has been felt throughout the city. Mark Singleton of Singleton-Galmann Realty, thinks that prices now have "clearly bottomed out," but residential-property values dropped about 20% from their peaks a few years ago. Hoboken Mayor Dawn Zimmer says she hopes to help Washington Street capitalize on the television success of "Cake Boss," which has led to long lines out the door of the 100-year-old bakery. The corner of Washington and First streets was renamed "Carlo's Bakery Way" last year. She says she met last week with bakery co-owner Buddy Valastro to discuss possibilities including a text-messaging system that would tell customers how long they have to wait, freeing them to browse other Washington Street shops instead of standing in line. The store's owners also agreed to link from the bakery's website to a Hoboken tourism site to be developed by the city, according to Ms. Zimmer and Adam Bourcier, a spokesman for the bakery. If we can help spread the love, we're happy to do it," Mr. Bourcier says. The city is also working on other measures to help businesses, including a push to ease parking problems on Washington Street, initiatives to help local businesses become more environmentally friendly and improvements to the city's permitting process, Ms. Zimmer says. Though some businesses have relocated or closed, including Nutrition Zone at 120 Washington and an HSBC Bank branch at 524 Washington, others are moving in. 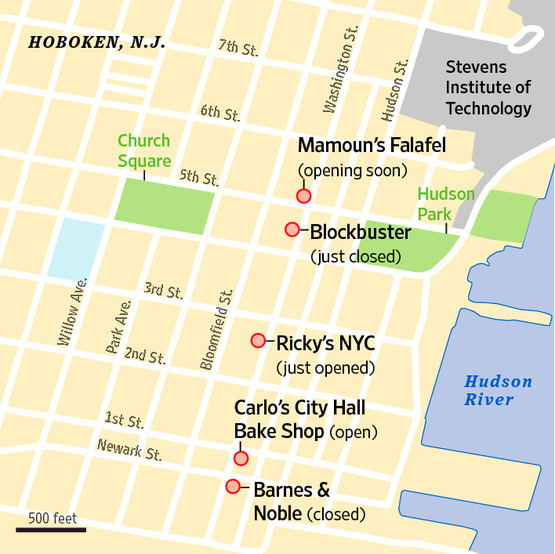 Mamoun's Falafel restaurant, a chain with two branches in New York City and one in New Haven, is opening at 502 Washington, one of a flurry of falafel joints opening on the strip. Last month Ricky's NYC, the New York-based beauty and novelty shop, opened its first New Jersey branch at 222 Washington, where it also set up a temporary pop-up store during the Halloween season. "It's a really young, hip and up-and-coming area. A lot of young people are moving there, a lot of young families, and that's our client base," says Todd Kenig, Ricky's chief executive. The company looked into opening up a store on Washington Street a couple of years ago but the rents then were too high, he says. This time, he says, "We were able to strike a deal." Prices for space vary widely along the strip, Mr. Singleton says, with downtown locations at the south end of Washington Street, closer to the NJ Transit terminal and PATH station, commanding monthly rents as high as $100 a square foot, and stores near his real-estate office on Washington and 11th streets renting for as little as $2 or $3 a square foot. Jeffrey Koenig, of Washington-Hudson Associates LP, which owns the space formerly occupied by Barnes & Noble, says he is close to consummating a deal to rent the space to a business he declined to identify, describing it only as a "household name." Over the past year, he says, he has fielded "a lot of national interest" in the spot, and attributes the delay to the general economic downturn. He hopes to have a deal within two months, he says. "It's a quality space in a quality city, a quality location," he says. "We're very optimistic." New York City is host to a multitude of dining venues, and your options expand mightily when you head just over the river (or under the river, if you take the PATH train) to New Jersey. Check out some of our favorite places to eat in Hoboken. We suggest you try the seared chicken breast as your entree if you chose to dine at this homey Irish pub-restaurant with views of the Hudson. The warm atmosphere at this local Irish eatery also boasts some pretty mean nachos. Come for a quaint family dinner, or post-party fun. The restaurant’s late-night menu is offered until 1:30 a.m.
You might call Clinton Social a hidden gem, as it sits away from Hoboken’s main strip of restaurants and retailers on Washington Street. This neighborhood hangout on the corner of Clinton St. & 7th Street is great in the way that you get head there for a post-work or game time drink (they offer extensive choices), or plan a quiet, dimly-lit dinner in their back dining room. While it’s about a 15-minute walk from the PATH train, it’s definitely worth the extra steps. Okay, so it’s a little pricey, but the waterfront Sunday brunch experience is worth your extra pennies. Nurse away the weekend with peach stuffed french toast and $5 mimosas. Just steps from the PATH train is some serious Southern comfort. Oddfellows Rest Louisiana Bar & Restaurant offers an authentic country feel – oh, and perhaps the most perfectly delicious cornbread you’ll ever try. With a long list of draft beers and specialty drinks (try the ‘New Orleans Lady’ for a preemptive taste of summertime), it’s a perfect pit stop for happy hour. Our favorite are the quesadillas, which are served to share – although after one bite, you probably won’t want to anymore. 10th and Willow is always a safe bet any time of the year, but with the warmer weather approaching, this corner restaurant is a must. The outdoor seating away from the hustle and bustle of Washington Street is nearly heavenly. On the inside, there’s an option for candlelit dinners or large tables to fill with appetizers (Monday means $5 unlimited wings). Atmosphere: A pub style restaurant and bar that is designed to appeal to everyone. The perfect place to grab a meal or enjoy a great late night party. Ornate woodwork, captivating architecture and a NYC skyline view offer all who enter a warm, welcoming atmosphere that entices patrons to cozy up with a perfectly poured pint and a delicious meal. At the Wicked Wolf Tavern we wish to bring people together to celebrate all life’s pleasures with wonderful food and drink. We offer a menu full of American Favorites and specialties, and our skilled staff is sure to deliver with superb service and brilliant conversation. We take great pride in presenting our guests with a comfortable environment and exceptional service. The Procession is on Saturday, Sept. 11th. The procession runs through the streets of Hoboken. Click the map below for the procession route.